He tried everything: sneaking between legs when new visitors come through the door, inspecting the small bathroom window to see if he could fit through it, searching behind the cages for a hidden entrance, and when none of that worked, longingly staring out the window to the blue sky. Our goose could not wait to be free. At least his search for freedom meant he was feeling better. 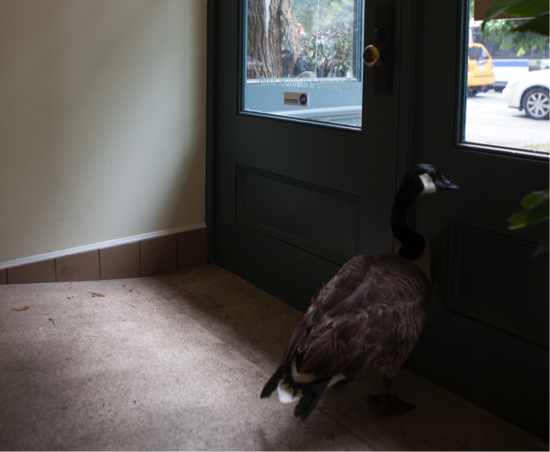 This Canada Goose (Branta canadensis) was found in Inwood, suffering from lead poisoning and unable to stand. As in humans, lead poisoning in birds causes weakness, lethargy, disorientation, and in high levels blindness, seizures, and death. Waterfowl are particularly susceptible to lead poisoning because of the amount of lead shot and lead sinkers that are found in their freshwater habitat. Although lead shot was banned for hunting waterfowl in 1991, it is still in use for hunting deer, and the spent shots are easily mistaken for pebbles that geese ingest to aid in digestion. Lead fishing weights can also be mistaken for grit. In New York, lead sinkers weighing less than an ounce, those that are most likely to be ingested, have been banned, although old ones still remain at the bottom of lakes and sale of larger ones continues. Our patient was medicated to remove the lead from his bloodstream and tube fed to help him bring his weight back up. Soon he was eating on his own, and as he got stronger, so did his desire to find freedom any way he could. After his round of medications was complete, we were able to successfully release this Canada Goose back to the North Cove wetlands where he had been found. As happy as he was to fly back to his flock, feel the wind under his wings and the water under his feet, we were even more thrilled to be able to finally grant him his wish.